"I'm embarrassed to ask it, because I don't know who you would explain it to, unless you think that a 1-year-old could learn immigration law," Judge John W. Richardson told the lawyer representing the 1-year-old boy. The boy is one of hundreds of children who need to be reunited with their parents after being separated at the border, many of them split from mothers and fathers as a result of the Trump administration's "zero-tolerance policy." The separations have become an embarrassment to the administration as stories of crying children separated from mothers and kept apart for weeks on end dominated the news in recent weeks. Critics have also seized on the nation's immigration court system that requires children — some still in diapers — to have appearances before judges and go through deportation proceedings while separated from their parents. Such children don't have a right to a court-appointed attorney, and 90 percent of kids without a lawyer are returned to their home countries, according to Kids in Need of Defense, a group that provides legal representation. 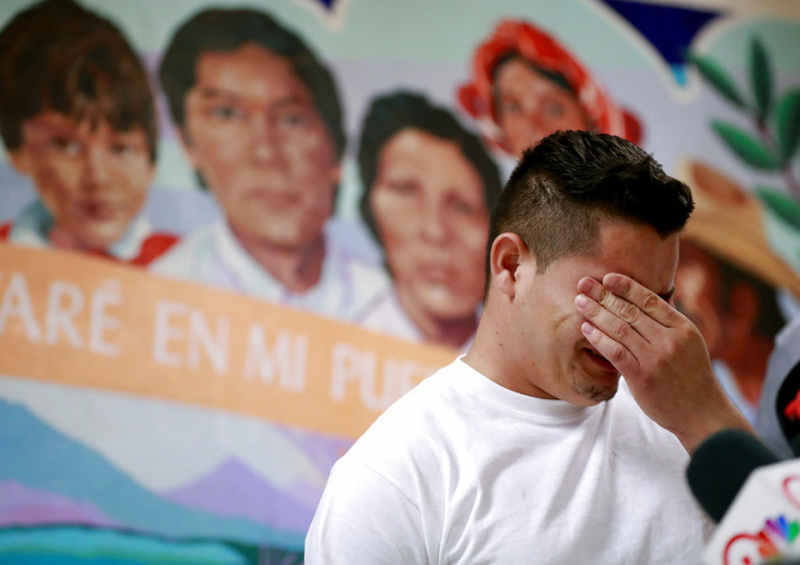 In Phoenix on Friday, the Honduran boy named Johan waited over an hour to see the judge. His attorney told Richardson that the boy's father had brought him to the U.S. but that they had been separated, although it's unclear when. He said the father, who was now in Honduras, was removed from the country under false pretenses that he would be able to leave with his son. Richardson said the boy's case raised red flags over a looming court-ordered deadline to reunite small children with their families. A federal judge in San Diego gave the agency until next Tuesday to reunite kids under 5 with their parents and until July 26 for all others. Richardson repeatedly told the Immigration and Customs Enforcement attorney who was acting as the prosecutor that he should make note of the cases involving young children because of the government's obligation to meet the reunification deadline. The attorney said he wasn't familiar with that deadline and that a different department within ICE handled such matters. ICE spokeswoman Jennifer Elzea said the attorney was familiar with the injunction but didn't know the specifics of the timeline requirements off the top of his head "and did not want to misspeak about any timeline commitments without that knowledge." The agency's Enforcement and Removal Operations is leading the review of cases who are a part of the class impacted by the judge's order, while the rest of the agency is supporting them in the effort to complete it in as efficient and accurate a manner possible. The boy's case was heard on the same day that the Trump administration said it needed more time to reunite 101 children under 5 years old to ensure the children's safety and to confirm their parental relationships. The two sides had a hearing on the matter Friday in San Diego and will determine over the weekend which cases merit a delay. Justice Department attorney Sarah Fabian stressed to the judge that the government is deploying significant resources to ensure that children are being reunited with parents in timely fashion. "What do you think about going back to Guatemala?" Richardson asked the boy. Granados sought out a suitable home to help reclaim his child by moving in with relatives in Fort Mill, S.C. — but now fears he won't be able to afford airfare for his girl to be reunited with him. He said authorities requested $1,250 to fly her from Chicago. "I haven't felt the happiness I should feel with being here in the United States," said Granados. "Happiness is when I have my daughter with me." He asked the girl whether she wanted to go back to Guatemala and she had a fear of getting hurt there. The girl said she wasn't afraid to go home, and Richardson granted her a voluntary departure. He asked her if she had ever been on a plane. When the girl nodded that she hadn't, Richardson said she was in for an experience.